Image: On his way to a win at the Sunset Pro Junior, Finn McGill scored two excellent 9-point rides. HALEIWA, North Shore, Oahu/Hawaii – (Sunday, January 21, 2018) — 2017 World Junior Champion Finn McGill (HAW) and Kauai’s Gabriela Bryan (HAW) captured the Sunset Pro Junior title in their respective Men’s and Women’s divisions today for a 1,000-point jump start to the 2018 World Surf League (WSL) Hawaii/Tahiti Nui Junior series. This is McGill’s first win at his homebreak of Sunset Beach on Oahu’s North Shore and Bryan’s premier professional WSL win. McGill went against an all-Hawaii final heat including 2017 Regional Junior Champion Barron Mamiya (HAW), who ended in third place, North Shore’s Kalani Rivero (HAW) who earned runner-up and Wyatt McHale (HAW) who finished fourth. 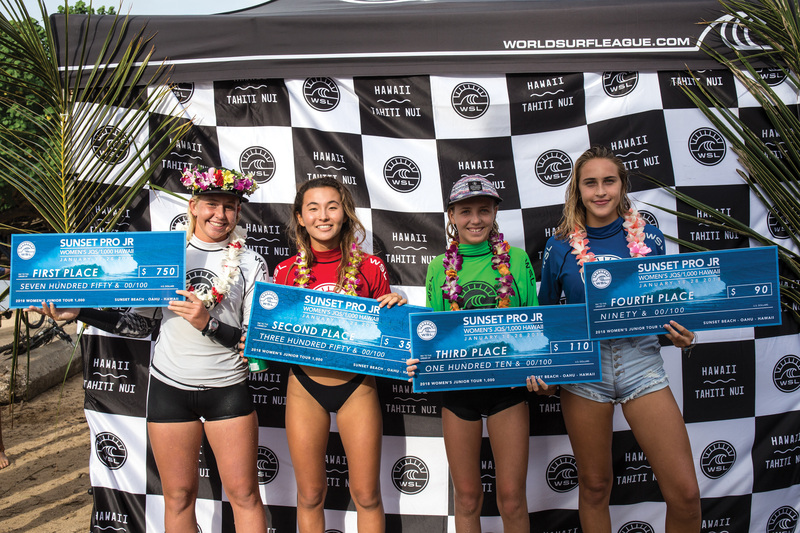 Bryan battled fellow Kauai surfer Keala Tomoda-Bannert (HAW), Valentina Resano (NIC) and Summer Ivy (HAW) in the hard-fought Final and made her debut at world-famous Sunset Beach. Bryan stayed patient and charged when it mattered most, dropping into overhead surf and committing on the biggest waves of the heat. Her first keeper score, a 5.0 (out of a possible 10), shot her to the lead ahead of Tomoda-Bannert and she was able to stave off competitors after posting a 6.15 on her last ride. The two Kauai girls battled for first and Tomoda-Bannert fought back with a 6.30 on her final wave, but it wasn’t enough to overtake the combined 11.15 points Bryan had in her score line. To be noted, Tomoda-Bannert posted the best wave of the Women’s division, an 8.75 in the second Quarterfinal, after a few technical turns on a set wave. This excellent score put her in rhythm for the rest of the competition and ultimately saw her earn a respectable second place result. In the Men’s Final, defending event winner Mamiya opened strong on his forehand and secured a 6.5 by linking together strong maneuvers, but McGill’s opening ride, a 9.0, changed the guard and saw the World Junior Champ jump to first. 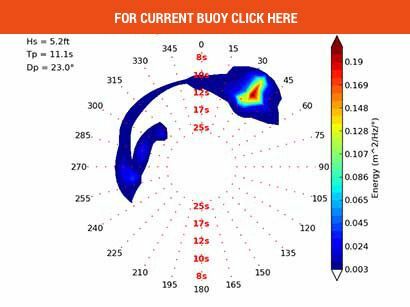 The 17-year-old scored another near-perfect 9.25 ride – the highest wave of the event – in the Quarterfinals for multiple powerful turns to advance well ahead of fellow competitors. After suffering a broken ankle in 2017, McGill has come back stronger than ever and has a renewed sense of stoke for surfing. Less than two weeks ago, McGill won the World Junior Championship in Kiama, Australia and after today’s victory, seems ready to tackle 2018 with confidence and power. McGill competed against friends Rivero, Mamiya and McHale, all who represent the incredible skill currently brewing on Oahu’s North Shore. The junior pool runs deep with talent and finalists bested a stacked field that included the region’s more recent Pro Junior winner Ocean Macedo (HAW), Maui phenom Eli Hanneman (HAW) and international upstarts Taichi Hagita (JPN) and Eimeo Czermak (PYF). The first 18 and Under competition of the new year, the Sunset Pro Junior featured 32 men and 14 women at the big wave break of Sunset Beach and is known to be an early indicator for year-ending success. The 2017 winners – Mamiya and Zoe McDougall (HAW) – went on to eventually win the 2017 Regional Junior titles. The Sunset Pro Junior runs in conjunction with the Men’s Sunset Pro, a QS1,000-rated event that got underway this past Thursday, January 18, and saw Round 1 and half of Round 2 complete. Contest organizers anticipate the competition to resume tomorrow morning, Monday, January 22, at 8:00am HST in solid 5-8ft. 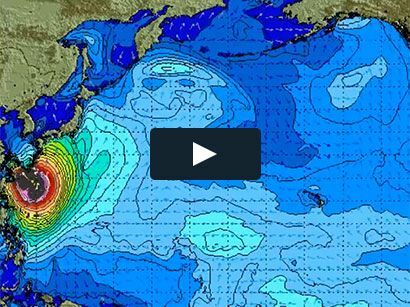 WNW-NW conditions with moderate E trade winds. 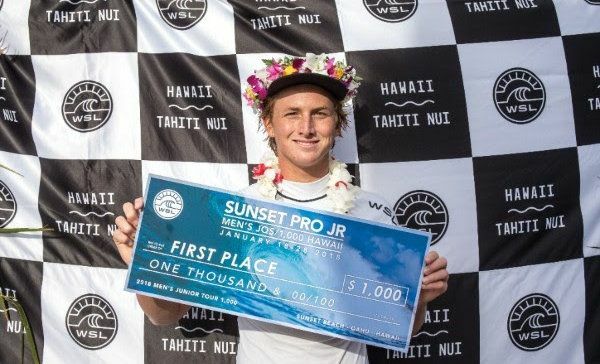 The Sunset Pro + Men’s and Women’s Pro Junior is a four-day surf competition that kicks off the WSL Hawaii/Tahiti Nui regional season with a holding window from January 18 – 28. The next event will be the Volcom Pipe Pro, a Men’s QS3,000, followed by the Tahitian leg – the Rangiroa Pro Open, a Men’s QS1,000, and the Papara Pro Open, a Men’s and Women’s QS1,000 and a Men’s and Women’s Pro Junior.